your fabulous FR gift certificate! 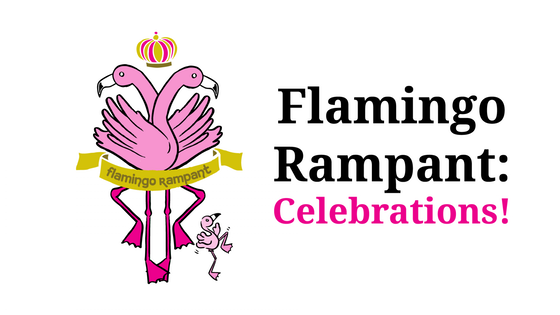 Are you planning to give Flamingo Rampant books set as a holiday gift? Here's our adorable holiday gift card by illustrator Katie Diamond, ready to download, print and wrap. Give it with crayons, so you can colour it together and look forward to wonderful stories ahead. All the warmest wintertime wishes from all of us to you! With a week yet to go, we have raised the money to make six completely delightful children's books that will offer great sweetness to untold children and families. You're the bestest backers a Bear could possibly imagine! THANK YOU. For the last week, we're focusing on our stretch goal - language access. With so many requests for Spanish books in the US and French books in Canada, we're hoping to make one of each! As of this writing, we're just $14,000 away from being able to make and print those books. I am hopeful and excited that we'll be able to offer other-language options this time, especially to schools. So! Please don't stop telling people about the project, posting and sharing and letting people know what we're up to. Just to remind you, if we meet the stretch goal EVERYONE who ordered a book set gets one of the other-language books, and the people who ordered the complete library get BOTH. Help us send you more books! Help us offer great new work about gender to huge additional swaths of the world! Let's be awesome(r) together. Thanks so much for your support, encouragement, sharing and sharing and sharing. You're the actual best. How about a little Wednesday magic? Good morning, beloved backers! That you SO MUCH for joining this project and helping make amazing kids books that not only feature LGBT2Q people but are also made BY LGBT2Q people. We're at the halfway point now, and we need a good strong finish to the project, so - I am going to ask for your help and sweeten the deal. Here's the ask: please take a minute today to post the Kickstarter link to social media and write even a few words about why you backed the project. You can copy and paste this link kck.st/2gRSCHS and let your Facebook friends or Twitter followers know why it's great for their family/a great holiday gift/a fabulous idea. And here's the sweetener: our stretch goal! If we reach $75,000 in funding, we'll make TWO MORE books - a Spanish version of Is That For A Boy Or A Girl? by S. Bear Bergman and a French version of Rachel's Christmas Boat (working title) by Sophie LaBelle - and EVERYONE who backed for a full set of books will receive one of them. So: would you like an extra book for FREE? We only need 450 people or institutions in the whole world to pre-order a set of books for you to get your free French or Spanish book (and to make so many bilingual educators SO happy). Just send out the link kck.st/2gRSCHS and help us make it happen! Holy hot out of the gate, Flamingos! Well, we are 4 days into our Kickstarter campaign and 25% funded (::happy dance::)! We've been given the coveted purple Projects We Love banner from Kickstarter, and gotten some early press coverage from mombian.com. Thanks so much to all of you who came out strong and threw down your money early to show your trust in the project. It means so much. We're having lots of exciting conversations behind the scenes about stretch goals - especially about the prospect of books in French and Spanish. With a strong first few days, it feels entirely possible that we might reach a dollar figure that would allow for translating and re-typesetting at least a couple books into Spanish and/or French, and adding one to every backer set. We'll let you know if that shimmers all the way into the realm of the possible, but meanwhile let us know - would it be great for you? Would another language be even better? What are your multi-lingual LGBT2Q kids picture book desires? By all means, keep liking and sharing and talking these books up to your friends, neighbors, local schools, librarians, and whatever else you've got. We still need to get about 500 people or institutions to pre-order a set of six books. We're optimistic, and we would also like all the help we can get.